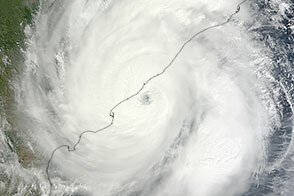 Although tropical cyclones are less likely to form in the Bay of Bengal than in the Atlantic or Pacific ocean basins, the storms that do form in this warm, shallow portion of the Indian Ocean have a reputation for being unusually destructive. In fact, eight of the ten deadliest tropical cyclones in history are believed to be Bay of Bengal storms, with all of these storms causing well over 100,000 deaths. 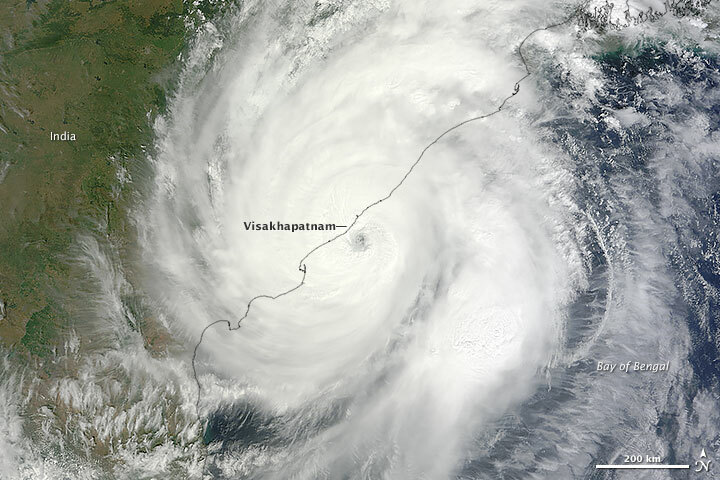 Several factors contribute to the destructiveness of Bay of Bengal storms. Simple geography is an important one. Since the Bay of Bengal is semi-enclosed, storms that form there are quite likely to strike land. And since much of the coastline is densely populated and low-lying, damage tends to be considerable when storms make landfall. Tropical Cyclone Hudhud, which slammed into India’s southeastern coast as a category 4 storm in October 2014, fits the trend. Bringing maximum sustained wind speeds of 217 kilometers (135 miles) per hour, the storm caused at least 22 deaths, forced hundreds of thousands of people to evacuate, and left a broad swath of destruction. 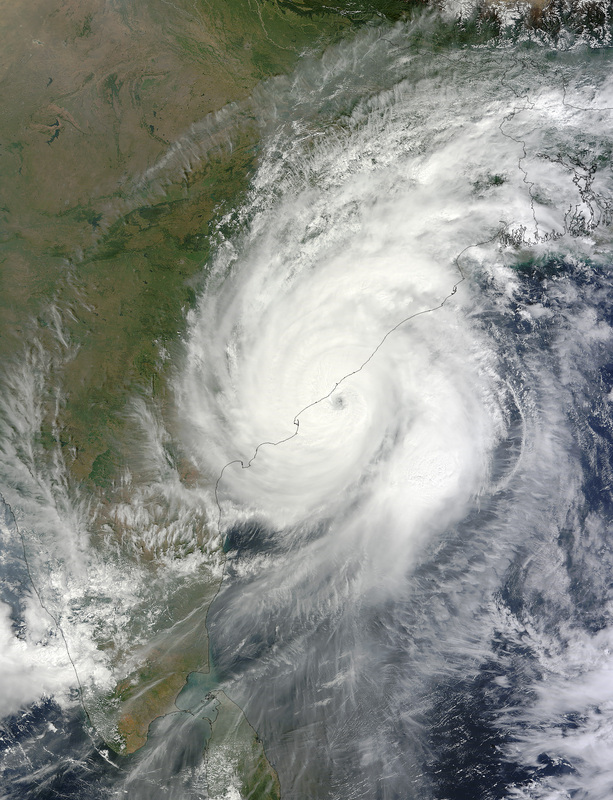 Preliminary estimates suggest the storm caused at least $1.64 billion of property damage, which would make Hudhud the second most expensive tropical cyclone in India’s history. In the coastal city of Visakhapatnam, the storm uprooted tens of thousands of electric poles, causing widespread blackouts. 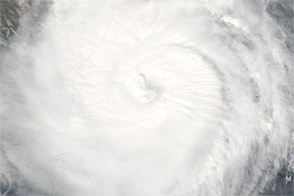 On October 12, 2014, the Moderate Resolution Imaging Spectroradiometer (MODIS) on NASA&apos;s Terra satellite acquired this natural-color image of Hudhud at 10:40 a.m. India Standard Time (0510 Universal Time). 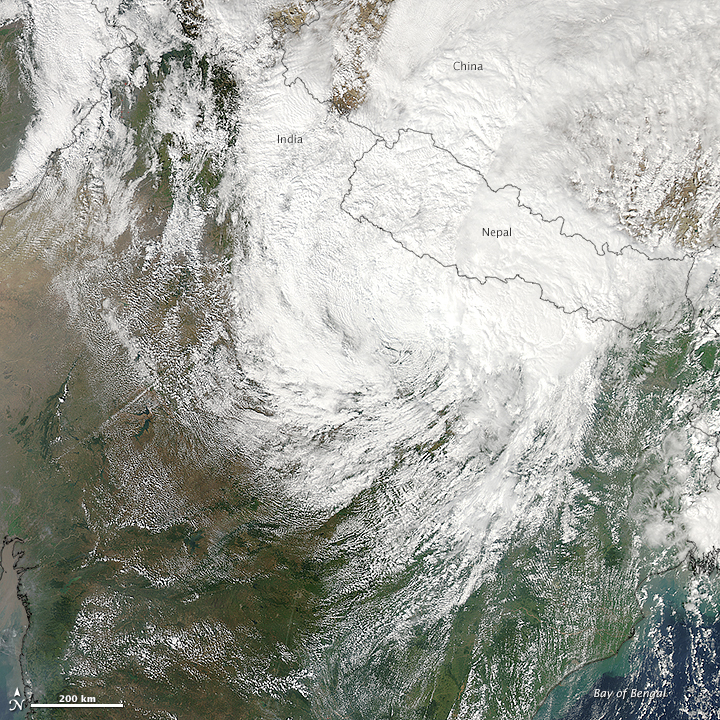 Two days later, the MODIS on Aqua captured the lower image, which shows remnants of the storm moving into central and northern India and Nepal. By October 14, 2014, the storm had weakened to a low-pressure system, according to the India Meteorological Department. Heavy rainfall and wind warnings remained in effect for Bihar, West Bengal, Sikkim, and Uttar Pradesh. 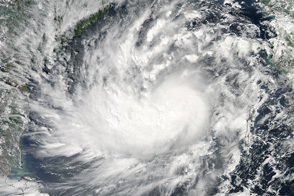 The storm went through a period of rapid intensification as it approached the India coast. Research published in May 2014 found that Bay of Bengal storms have grown more intense since 1981 due to increasing sea surface temperatures. 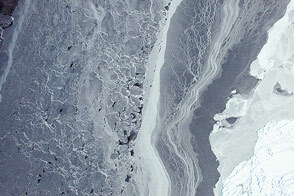 NASA image courtesy Jeff Schmaltz, LANCE MODIS Rapid Response Team at NASA GSFC. 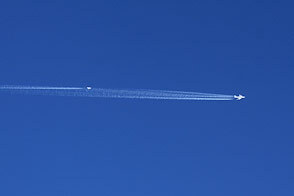 Caption by Kathryn Hansen and Adam Voiland. 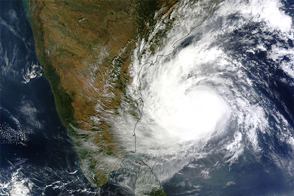 The tropical cyclone surged across India's coastline on October 12, 2014. 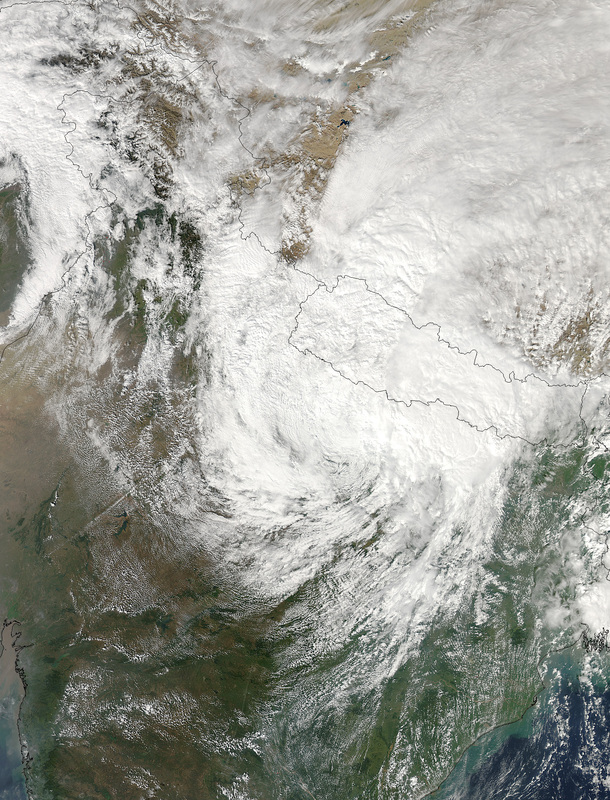 In early October 2014, the storm crossed the Bay of Bengal for possible landfall in India. Balaguru, K. et al, (2014, May 29) Increase in the intensity of postmonsoon Bay of Bengal tropical cyclones. Geophysical Research Letters. 41 (10), 3594-3601. India Meteorological Department (2014, October 14) Regional Specialized Meteorological Centre for Tropical Cyclones Over North Indian Ocean. Accessed October 13, 2014. Jeff Masters WunderBlog, via Weather Underground (2014, October 13) Gonzalo Near Hurricane Strength; 24 Dead, $1.6 Billion in Damage in India From Hudhud. Accessed October 13, 2014. The Times of India (2014, October 13) Cyclone Hudhud aftermath: Heavy rainfall to add to woes. Accessed October 14, 2014. The Times of India (2014, October 13) Hudhud makes landfall: Visakhapatnam plunges into darkness. Accessed October 14, 2014. Unisys Weather (2014, October 14) Cyclone-4 Hudhud. Accessed October 14, 2014. Washington Post (2014, October 13) Deadly Tropical Cyclone Hudhud lashes India with winds over 100 mph. Accessed October 14, 2014.